We recently published a new customer case study with POLITICO, a nonpartisan, Washington-based political journalism organization that covers the Presidency, Congress, the 2012 presidential race, Washington lobbying, and the intersection of politics with Wall Street, the media and personalities. POLITICO content is published online and in print via its newspaper, but is also accessible on mobile devices and tablets. When POLITICO launched in 2007, it revolutionized the way politics were covered by providing up-to-the-minute political news and analysis through articles, blog posts and video. At the time, POLITICO needed an online video platform that could disseminate video in real-time to its audiences across a wide range of properties, including online and mobile. The organization chose the Brightcove Video Cloud online video platform to support its video strategy and has continued to evolve with Video Cloud since then. Today, POLITICO has a team of video producers who shoot, edit and post videos online using Video Cloud within minutes of newsmaker interviews, political speeches or breaking news. A prime example of this "as it happens" content came this past May when news broke that Osama Bin Laden had been killed. Within minutes of the announcement, POLITICO uploaded video of President Obama's speech to Vide Cloud, making it instantly available to audiences online and on mobile devices. 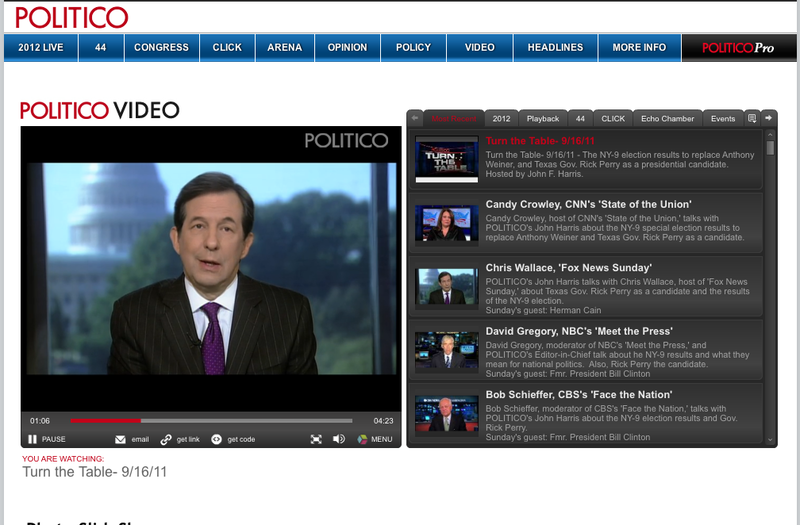 POLITICO has also taken advantage of the range of advertising features in Video Cloud to generate additional revenue. POLITICO monetizes its video content through pre- and mid-roll advertisements, which supplements the revenue it receives from traditional print and online banner advertising. Additionally, Video Cloud's analytics enable POLITICO to analyze viewer behaviors. As a result, the organization has discovered that its average viewer retention rate is extremely high -- between 70 to 70% of an average video. We are very excited about the great things that POLITICO is doing with online video and our platform, and look forward to seeing their video business grow in the future.